Happy Wednesday!!! We’ve almost made it halfway through the week! Today on the blog, I’m featuring this cute and slouchy off the shoulder sweater that SheIn sent me to review. *Sponsored post, but all opinions are my own. Post contains affiliate links. 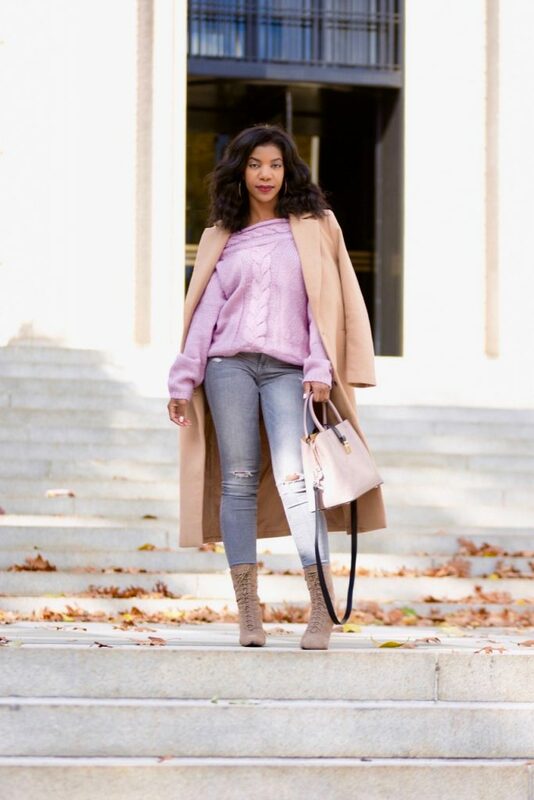 It’s officially sweater weather, which is why I chose this sweater to style and review. I love it, this lilac color is really pretty, and puts me in a good mood, even when it’s super cold outside. It’s also very cozy and slouchy. The quality is great, and it’ll definitely keep you warm. It actually is one size fits all, so the level of slouch that it has will depend on what your normal size is. I’d say it definitely would fit anyone who wears an XS-L, and probably would fit those who are a size M the best (I’m a size S in sweaters). If you’d like to purchase this sweater for yourself, you can get it here. I’m on a neutrals kick, per usual, so I paired the sweater with gray jeans, and all neutral everything else. I’m holding my hair in most of these pictures because the wind was something serious when I shot this look (and my next three looks that will be posted). Thanks for reading! Are you rocking off the shoulder sweaters this fall? Let me know below! I love this look and it’s so versatile. It’s like what Olivia Pope would wear if she had a social life and went to brunch with friends. This is actually my favorite color! I have a ton of sweaters, it’s the only reason I look forward to the winter. Thank you for sharing ! Love the camel coat! I almost got one last weekend, and chickened out. I haven’t stopped thinking about it since. I feel like a camel cat is in my near future. I love the color of the sweater and bag! You better work it! You are trying to take all of my money. I just placed an order for some pieces last week. You are trying to take all of my money. I just placed an order for some pieces last week. I’m definately taking the off the shoulder trend into winter. I love this cute sweater on you. Such a gorgeous color, cut, and price point. Atlanta is playing because I kinda want sweater weather but we still in the 60s. You look cute per usually love and the coat is super chic too. I always love your style and your photos are amazing! 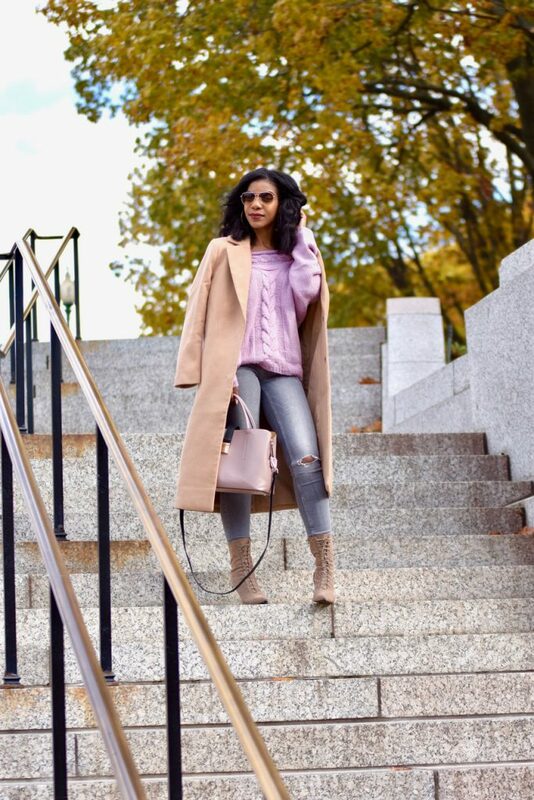 I have a camel coat in my fall wardrobe and love it but I think I need to add that sweater to my collection. This has been such a mild fall in the DC area, I could totally see myself rocking this look. Looks great on you. I’m way too old for the holes in the jeans look LOL! But I love the sweater and the camel boots. Awesome! You look so amazing! I absolutely love your outfit! Especially that sweater. I need something like that. That’s a gorgeous sweater and color. I love the combo of the thick plush top and the boots. Stylish and practical. I love this look! Neutrals are versatile. I can think of so many ways to wear this.